What I think makes for an effective slogan is the convergence of both substance and style. In terms of style, it needs to “have a ring to it.” This is the elusive element that old time advertising wizards (like the guys on Mad Men) were known for. They didn’t use semiotics or understand semantics. They just knew in their gut what sounded like a winning slogan. The good ones had “an ear” for a good slogan. Increasingly these days they are replaced by more scientific types who prefer to invest in the science of linguistics, which of course can tell us a great deal. But the question is whether it is a science that is already 100% reliable, which it isn’t yet. The central theme of Gladwell’s article is to examine as he puts it, those who “believe in a rule-bound universe.” He quickly makes his way to the greatest book ever written about screenwriting, “Adventures in the Screen Trade” by William Goldman (who won two Oscars for “Butch Cassidy and the Sundance Kid” and “All the Presidents Men”). I love that book and I love Goldman’s basic philosophy which is that moviemaking is an art and as a result, “Nobody knows anything.” Which means if anyone ever tells you with absolute certainty about what does and doesn’t work for movies, they are definitely wrong. I mentioned in my book that I got a sample of this in 1996 when I made an award winning musical comedy, then was told by every agent and producer I met with that musicals as a genre were dead and over with, left behind in the 1950’s, never to be seen again at the box office. It wasn’t like they said these things with any qualifying words about, “Seems to me,” or “Most likely.” They just spat out the pronouncement as the gospel truth. And of course a few years later there was “Chicago” and “Moulin Rouge” and general agreement that musicals are far from dead. I saw the same thing in 1995 when a bunch of my film school classmates got the screenplay for “Titanic” while it was in production and came up with the group consensus that the movie would be the biggest flop in history because, “There’s no suspense — the ship sinks, everybody already knows how the movie ends, why would anyone ever pay to see it?” So much for the rule that people have to “not know” the ending of a story to be able to enjoy it. The examples are endless. There is SOME science to the making of movies. But its not all science. There is SOME science to communicating science. But contrary to what the fans of social psychology and “framing” and mental models and lots of other dreams for a “science of science communication,” it’s still just as random and unpredictable as making movies. So you find the perfect slogan that has a beautiful ring to it and everyone loves just mouthing the words. But there’s another element. Does your slogan contain any information? Or is it utterly vacuous. This is where substance comes into play, and is best explored by going through three examples I’m familiar with. The first is a slogan, the second and third are campaign names. This is the slogan the opponents of evolution came up with a decade ago which proved to be fairly brilliant for them. It had both substance and style. In terms of style, it clearly “has a ring to it.” The words roll off the tongue with a natural cadence. In terms of substance it also does well because after the dust settles, it leaves you asking, “what controversy?” with the answer being, “THE controversy,” which leaves you even more intrigued, and of course controversies are automatically good stories because they involve tension and conflict so you’ve gone and built your slogan around “a good story” and we all know that good stories are gold when it comes to mass communication. At “Flock of Dodos” screenings audience members always concede that it’s a brilliant and powerful slogan, then they point to the scene in the movie where I asked paleontologist Dave Bottjer if the evolutionists have an equal slogan and he says, “Teach the Science,” and the audience just laughs. Why are they so quick to laugh? Because that slogan just doesn’t have a ring to it. It’s like asking who you’re going to send into battle against, “The Masked Avenger,” and answering, “The Powerful Weapon User.” Just doesn’t have the same ring to it. Anyhow, there is an element of both art AND luck to coming up with a great slogan. Evolutionists have thought and thought about this challenge of producing an equal and opposite slogan to “Teach the Controversy.” But so far … nothing. There simply may not exist, anywhere in the cosmos, an equally effective slogan in this case. However, the question of whether an equally powerful slogan DOES exist is an non-falsifiable proposition. Just like the idea of intelligent design. I talked at length in the book about our creating a media campaign around the term “shifting baselines,” which was coined in 1995. I no longer own any stock in this issue. I no longer care if anyone in the world ever mentions “the term” again. It’s sprung to life reasonably well over the past decade (in November, 2002 a Google search of the term produced only one hit, today it produces hundreds of pages of websites using it), but let me share with you my thinking in 2002 when I decided to take my partner Dr. Jeremy Jackson up on his suggestion that we throw all our communication energy behind this term. The term “shifting baselines,” is kind of so-so when it comes to style. There’s a little bit of a ring to it, but not anything explosive. And a fair number of people think its “too technical,” though they tend to be technical types themselves who live in fear of not being understood. So I’d give the term a “C” when it comes to style. But the reason we threw our energy behind it is because it rates an “A” when it comes to substance. Shifting baselines generally refers to the failure to notice change. There are a number of other versions of it, such as “normalization” or “creeping normalcy,” which is the term used by Jared Diamond in his book, “Collapse.” Those terms might rate better for style, but my feeling is they are far inferior on substance. The thing about “shifting baselines” is that it has this very important term “baselines” in it, and THAT (the failure to know what the baselines are for a given ecosystem) is the real source of the environmental problems we’re talking about. So there is intrinsic value and information to the term itself. Terms like normalization and creeping normalcy are only pointing to “normal,” which itself is a highly subjective concept. Finding out what is normal isn’t going to do anything to help you solve the problems. Finding the baselines will. So my feeling was that even if people didn’t totally grasp the term “shifting baselines,” just forcing them to hear the word “baseline,” increases their sensitization to this term which is so incredibly important in conservation. The bottom line is that the substance is so great for the term “shifting baselines” that its worth dealing with the shortcomings in style because in the end, after the (albeit limited) beauty of the term fades, it still leaves you with an interesting and important piece of environmental science. And this way of thinking about campaign labels and slogans leads to the third example. Over the past couple years an international project on combatting global warming came together around the label “350.” In the second chapter of my book (the chapter titled, “Don’t Be So Literal Minded”) I criticized an ocean conservation project for basing it’s name around a number rather than a more humanized slogan. I pointed out that most people aren’t that drawn to numbers, and you certainly have never heard a presidential campaign built around a number. So you’d think I’d be critical of this 350 campaign for the same reason. But I’m not. My feeling about it is similar to what I just said about shifting baselines. The name 350 is pretty bad for style — it’s a frickin’ number. But as a label it has an enormous amount of substance because it represents the agreed upon threshold level for carbon dioxide in our atmosphere which is 350 parts per million. That is the number we never should have gone beyond (today we’re approaching 400) and it needs to be our goal in reducing carbon dioxide levels in the atmosphere. What this means is that even if the campaign doesn’t catalyze a wildly, blindly enthusiastic worldwide campaign that succeeds in stopping carbon emissions, after it is done and over — when the dust has settled — it will have at least placed a little bit of buzz around a single number. And at least a few people, when they hear a talk about global warming and hear the speaker start talking about 350 ppm, they will be a tiny bit more receptive to that one all important number, saying to themselves, “Oh, yeah, that was that failed campaign a couple years ago.” That is the value of having some substance, even at the cost of style, to your slogan. And compare that to a campaign titled, “Save Our Atmosphere.” When that campaign ends there will be nothing — it has no substance, it will leave no lasting imprint. This is also the final conclusion of Gladwell’s wonderful article about the men who thought they had figured out “the formula” of making hit movies — that their metrics really only work for a limited number of movies, and even then are of limited precision. 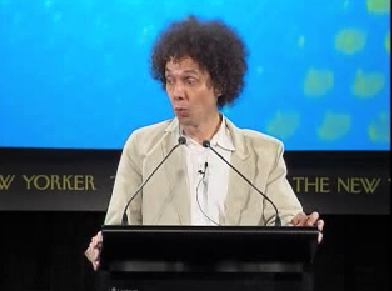 Gladwell is such a great communicator. The only thing better than his New Yorker article is the video of him presenting the article as a speech. He is a truly gifted storyteller. He makes me think of a young Jeremy Jackson, both in appearance and speaking style. And as for finding the perfect slogan — I can only propose you consider one question: Got Slogan?